I recently had the pleasure of reviewing a brand new Tournament 2000 Bluewater Gen2 package. Powering this boat was a new Suzuki DF200ATX outboard motor, a marine engine that was an excellent match for this hull. The new four-cylinder, 147kW (200mhp) Suzuki DF200ATX four-stroke outboard motor is 30kg lighter than the DF200 V6, adding to a widening choice for boats in need of more gumption, better economy and less weight on the transom. Featuring Suzuki’s Lean Burn technology, the DF200A enables low fuel consumption, while delivering some perky power from the 2.867cc big-block engine. 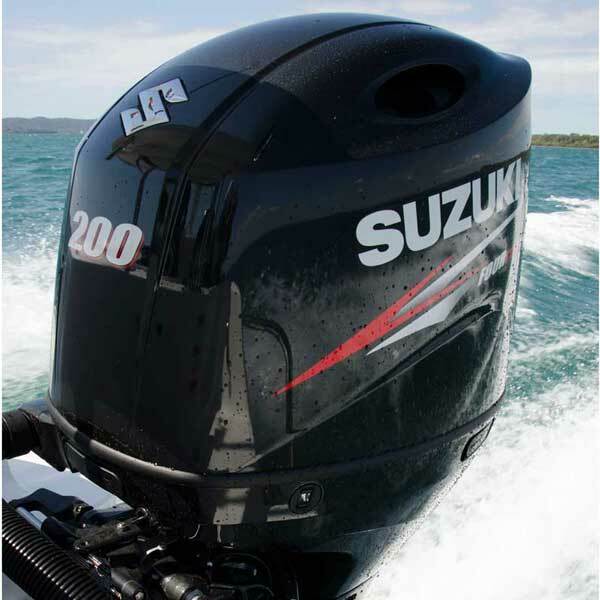 As tested on the Tournament 2000 Bluewater Gen2, the new Suzuki DF200ATX outboard motor is perfectly matched and sips a mere 27.9lt/h at 28.7kts and 4500rpm for a range of around 143.5nm off a tank of 140lt. That’s not something to complain about. Greater holeshot power delivery through a two-stage gear reduction at 2.50:1 is definitely noticeable with the Tournament 2000 Bluewater Gen2 hopping onto the plane effortlessly. Standard Suzuki four-stroke outboard engines are so quiet that it’s not uncommon for boaters to try to start them while they’re running. I did find the Suzuki DF200A to have more of a crackle, especially when opening it up to wide open throttle. Regardless, it didn’t bother me as it’s more of a hum than a hindrance at standard cruise speeds of around 25kts. Weighing around 30kg lighter than the V6 models, the Suzuki DF200ATX outboard motor is more compact on the transom and hence higher off the water. Lightening the transom can also prevent flooding into the well and enables more weight of other items to be shifted towards the transom in single and twin engine installations if suitable. For hulls with specified weight restrictions, this could be the answer to having increased horsepower, just with less weight. 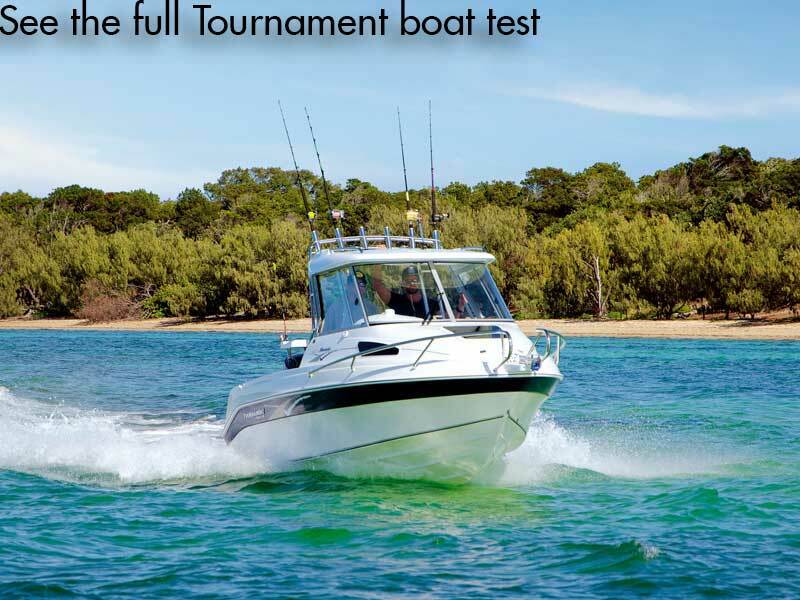 We rate and test this boat: Tournament 2000 Bluewater Gen2 boat review. Backing off the throttles to usual troll speeds, again fuel consumption was low and impressive, with 4.75lt/h being sipped at 5.4kts and 1500rpm, or 7.1lt/h at 6.74kts at 2000rpm. For those pumping up the troll speeds to around 10 to 12kts you can expect a fuel burn of around 11 to 12lt/h. Other key features found on the new Suzuki DF200A outboard motor include: counter rotation option, keyless start system (DF200AP), Suzuki Precision Control (electronic throttle and shift), and new multifunction digital gauges with colour screens. The DF200A is the ideal outboard for those chasing optimum performance with less weight on the transom, as well as economy that keeps you away from the fuel bowser. Besides suiting many monohulls, the Suzuki DF200A outboard engine could be the answer for those who own catamarans and need a repower, or those potentially going to own one. Suzuki DF200A on Tournament 2000 Bluewater Gen2. See the full version of this review in Trade-A-Boat #473, January 2016. Why not subscribe today?